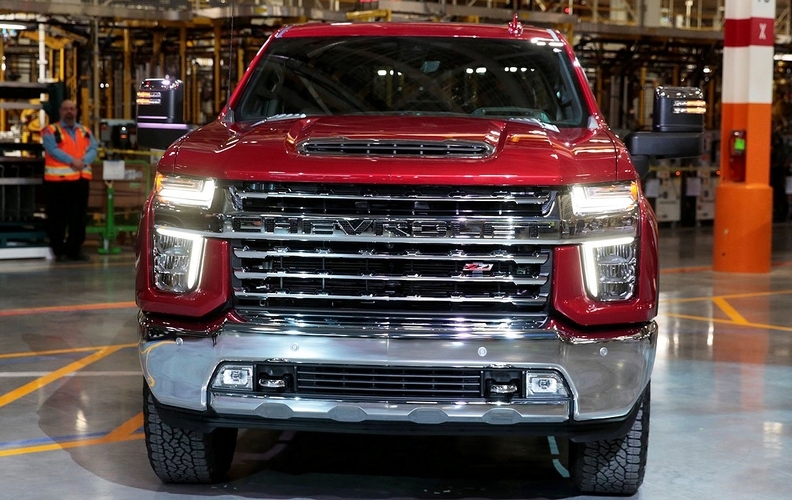 DETROIT — General Motors swung to fourth-quarter net income of just over US$2 billion, as strong North American results offset restructuring costs and losses in its international operations and autonomous-vehicle unit. The fourth-quarter results compare to a year ago when the company reported a record operating profit of $3.1 billion (all figures in USD) for the period but a net loss of $4.9 billion due primarily to U.S. tax reform. Those results were based on continuing operations, after the company's sale of its European operations. In the fourth quarter, GM's adjusted earnings, before interest and taxes, decreased 8.3 per cent to $2.8 billion, and its global margin declined 0.8 percentage point to 7.4 per cent. Revenue increased 1.8 per cent to $38.4 billion. For the year, the automaker's adjusted earnings, before interest and taxes, were down 8.3 per cent to $11.8 billion from 2017, while income from continuing operations increased to $8.1 billion from $348 million. “General Motors is raking in money. Executives and shareholders continue to do incredibly well while they callously plan to take away the very livelihood of Canadian workers in Oshawa,” Unifor President Jerry Dias said in a statement. A robust North American profit of $10.8 billion translates into average UAW profit-sharing checks of $10,750 per worker, about $1,000 less than 2017's payouts. "The UAW Membership makes the components for and builds the finest General Motors cars, trucks, crossovers, SUVs and vans in the world right here in the U.S.A. That is the driving force behind propelling GM to make $10.769 billion in net profits in the U.S. for 2018," the UAW said in a statement on Wednesday. "Profit Sharing payments to UAW-GM Members up to $10,750 is because the UAW proposed this during negotiations; achieved it at the bargaining table and our members ratified it." Dias told Automotive News Canada on Wednesday that Unifor remains uninterested in adopting profit sharing in Canada, saying the union prefers higher guaranteed wages. "Our members, on average, make over $5 more per hour than they do with the UAW," he said. "So we get $10,000 more per year every year, not just during times of high profitability. I'd rather [have] a guaranteed $10,000 a year." North American earnings increased 5.8 per cent to $3 billion in the fourth quarter. GM on Feb. 22 expects to pay up to $10,750 in profit sharing payments based on North American earnings to UAW members, down $1,000 from $11,750 in 2017. GM Financial reported earnings of $416 million, up 38 per cent from $301 million a year earlier. Fifty-six perc ent of GM’s sales in the fourth quarter were financed through GM Financial. Operating profit margin: The North American margin for the year was 9.5 per cent, including 10.2 per cent for the fourth quarter. It was the first time since 2014 that the company’s profit margin for the region dropped below 10 per cent.